I'm currently using Linux Mint 10. Why? because it is easy to use after install and it's good for using in daily life, which is true. But when it comes to server part or hacking, I cannot do anything at all. Maybe because I'm running the desktop edition, so no package for apache, postgresql, mysql or Sun-Java6(which is not server). And to re-install any new OS again would be tremendous work for me right now. I wanted to play with Armitage from the day I saw it released, but I just had time to play with it today. Anyhow, to use Armitage, it requires one database(for metasploit), and Sun's Java (Armitage is running on Java JVM). Unfortunately, I couldn't find it in Synaptic. I need to install it myself. So, I went to Ubuntu package search and did a search for the package that I think I need. There's no postgresql in Mint. Hopefully, I can find it from Ubuntu repository. After this, it's time to configure the postgresql server. In the installation process, it will create user named "postgres" in the system for me. This user acts in the postgresql server's admin role. Note that the package creates for me (I don't know the password). So, it'd be a good idea to change password, both on database server and system. Now Postgresql should be up and running. It's a recommendation from Armitage that we "must" run it on Sun's Java JVM (using package "sun-java6-jdk, not OpenJDK which was installed before by Mint). It's very tricky part, since Mint doesn't provide any Sun's JDK package. 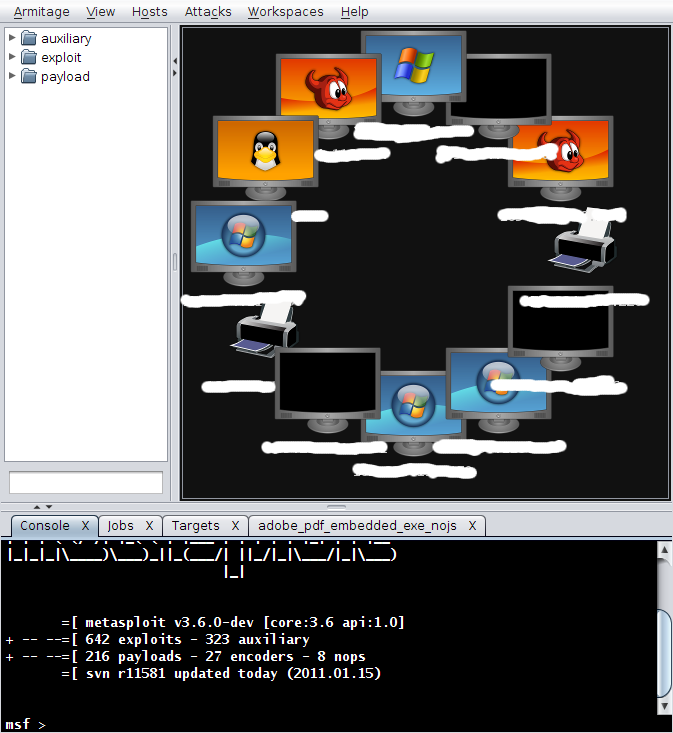 This time, it's in PPA, but it's based on Ubuntu version anyway. REMEMBER to completely remove any OpenJDK out of the system. It's a good idea to remove EVERY java package first before installing this (including sun-java-jre). Then, just install this package "sun-java6-jdk"
To make sure that's correct version running. Try this command in console. It should show like this. Finally, all pre-requisite is done. It's time to play with Armitage. First create new user for metasploit in PostgreSQL server. In this case, I'll use "msf" and "msfpass" as username and password, and I'll give it SuperUser priviledge. Then, it's ready to use. This is after nmap scan. Every machine shows here. The black screen means OS is unidentified. It's very cool that Armitage automatically filter down the attack vectors for you after the host is listed. Thank you for the tip for making it more complete. Nmap is the first tool I always install, so I haven't noticed it requires Nmap. Thanks. You really did a good job at collecting all this info. After several hours of installing mysql and trying to get it to work, I gave up and went with postgresql. I used this guide and got it working, but it kicked me off the db if I did anything that accessed it. 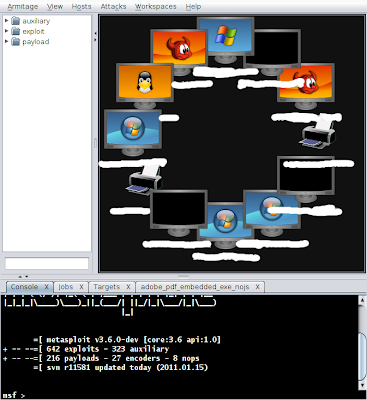 Though a lot of people say you don't have to sudo, I couldn't run nmap without sudo. My sql d/c problem came from permission problems with the config file. Apparently armitage runs db_connect repeatedly with values in database.yml. Once I changed permissions, everything ran smoothly.